Hi guys, thank you for joining us in our very first facebook live today. So Ying Wei, do you remember how long you have been adopting this 7 skincare steps? improving my skin and can see that, you know, it really have that glow and radiance. So I am very satisfied with this routine and will continue to do that. Ok, Great! Same for me too. you achieve a brighter and clearer skin. audience are able to learn from you as well. 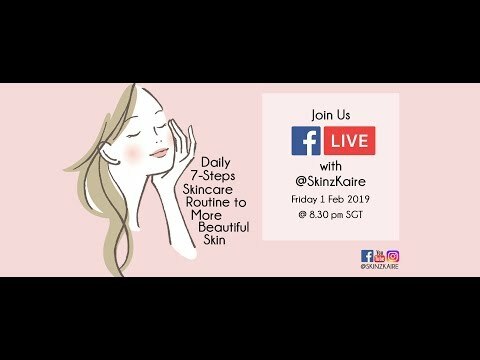 So if we have never met before, we are the co-founders of Skinz Kaire and I am Xueli. And one more, hiding behind the scene, I am Anna. also healthy lifestyles, minds and bodies as well. We have done studies and have some researches. lifestyle is one of the best ways to slow down the signs of aging. We really love to have you here today. also to share the broadcast to your friends. the video will benefit your circles of friends as well. Please feel free to leave your comments and share your skincare routines with us again. We would love to try out your routines as well. Without further delay, let's start the topic for today. routine by all three of us. We strongly encourage everybody to adopt. The 7-steps skincare routine include, number 1: cleansing. and we will tell you why later. Step 2 will be a toner. But this step is often neglected by many people. We will share more later on the importance of a toner. dullness and rough texture of the skin. Step 4 will be serum. Face serums are actually light weight moisturizer. to deliver the necessary nutrients into your skin. Step 5 will be face oil. most of your skincare list. we tried and truly understand the benefits of face oil. We will share with you more of the benefits in just a while later. Moisturizers are typically used to help your skin surface stay hydrated and moisturized. So moisturizers can come in lotions or creams forms. And this is the last step to our skincare routine for day time. Everyone should use sunscreen to help protect yourself from the sun's harmful UV rays. with masks at least once or twice a week. routine that we are carry out every day. Ying Wei will be the demonstrator. Step 1, wash your hands clean with soap which she has already washed with warm water. So this will make your skincare products more effective. So cleansing, we will usually do a double cleanse, that means two times. Double cleanse is actually inspired by Korean and Japanese skincare methods. So just now Ying Wei has demonstrated to you the oil cleansing part. The oil cleansing part is the first part, we use an oil base cleanser. You can get it anywhere from Guardian or Watson. This is to first dissolve the make up, the sunscreen, the oil and grime on the skin. demonstrated to you and then you can use a cotton pad to clean away the grime. proceed on to the next step which is the foam cleanser. This cleansing is done with a gentle cleanser. For Ying Wei's case, she has a normal skin type, she is using a foam cleanser or a gel cleanser. Using a foam or gel cleanser is actually more recommended to oily or normal skin. before applying onto the face. will cause a lot of dryness in the later stages. that the fine foam cleanses better by penetrating into the pores to unclog those residual oils. The prevents stripping off of too much natural oils on your skin. So now we will proceed on to step 2.
with the products that follow after that. All skin will benefit from toner. Ying Wei is currently doing. Traditionally, toners are used to restore your skin's ph balance of the cleansing. So you see Ying Wei's face is quite clear and very clean. There is no pimples and no acne. Step 3 is to apply amouple. and rough skin texture of skin. And this is possible due to the high concentration of anti-oxidants and vitamins. Usually, just a few drops is enough to do the trick. restructure and renew for skin cell regeneration process. skin as what Ying Wei has demonstrated earlier. of the ampoule and do stay tune to us. Stay tune, it's very important! We will reveal in our next few facebook live. Step 4 is the application of serum. of active ingredients as compared to normal moisturizers. and make your pores appear smaller. to be applied onto the skin. Daily Vanity's 2019 Beauty Awards as one of the best anti-aging serum. So ya, think the voting has already ended. It's one for the best anti-aging serums to help plump up and smoothen our skin texture. Okay, you see, is very plump! The serum contains a Sodium Hyaluronate which helps to increase the hydration level of the skin. In addition, this serum also help to lighten spots and brighten the skin. So with continuous usage, you can see that Ying Wei's skin is brighter. She previously has some pigmentation issue and has lightened. The way that we apply the serum is very similar to ampoule. and you can actually know how to massage it into your face. Maybe you can also share with us if you do use ampoule and serum like us. Step 5 is what Ying Wei is currently demonstrating to you is to use the face oil. and molecules are very small so they can penetrate deeper into the skin layers. skin type and to nourish your skin. jojoba and red raspberry seed oil but it is also contains a blend of precious essential oils as well. The essential oils help to balance and improve our skin growth and improve our skin conditions. So you can see after application, the skin surface is so much brighter. We can do a tissue test also. Yap, you can do a tissue test. You can see that the face oil is fully absorbed into the skin. You don't see any, there is no oil blots on the tissue paper. Ya, so you see, we will do the drop test. It doesn't stick, the tissue does stick on the face. Not at all. because many people are very confused with the difference between hydration and moisturization. Since that they have combination or oily skin, they should avoid products with oil. Facial oil actually help to seal in the moisture and adds extra nourishment to the face. face oil will help your foundation to be applied more smoothly. enough oil to form a protective layer on your skin. is always very flaky and dry. of us do, then your skin is battling with dehydration. In this case, we will need ampoule and serum. So do stay tune again. One news is that our Franki Glow Face Oil is currently out of stock. The 5 ml Franki Glow Face Oil is currently out of stock. You can do a pre-order now if you are interested. So when the oil comes in, we can send it to you. can still cart out the free 2 ml sample from our website at skinzkaire.sg. you cart out the 2 ml face oil. it is really good for your skin why not just try it since it is free. It is free and we are covering the postage. you can just mix together. It works the same. The next step, step number 6, is moisturizer. it helps to seal in the wonderful ingredients within our skin and let them work their wonders. Our favorite is our Skin Perfecting Cream. It's slightly tinted and therefore, it helps to brighten up our skin after we apply. So what we need to do is to pump 1 pump with the pump and apply, pat onto your face. bacteria from going to your skin surface. Our Skin Perfecting Cream actually has many herbal essentials to help soothe skin sensitivities. can help to kill pimple quite fast right. is showing the effect too immediate right, we should have some doubt about that. your pimple so your pimple actually heals faster, within a few days? We tested on one of our customers who has a very big pimple. We tested it and then he tried for a few days and it subsided and commented is good. Do try it. Do login in and try. We are having a promotion now for Chinese New Year Promotion. We are selling our whole package at $188. oil comes in, we will send it to you with no charge. I mean the courier will be covered as well. The final step will be the sunscreen. You also do that in evening when the sun is still there. This is a very important step, especially during day time. Especially in Singapore, the sun is always up there. to capture UV rays and convert it into other forms of molecules. So it's not very good to the skin. The chemical get absorbed into the skin and does a lot of harm and damages into the skin. it blocks out and shield out the sun's rays by reflection. That's why we choose physical sunscreen which only contains mainly zinc oxide and titanium dioxide. readily and quite fast you can complete the whole process within less than 10 minutes. Yeah, it's actually a very fast routine. Not to worry if you are in a hurry or you are, with time constraint. With just simply that 7 steps, that actually can help your skin to glow and be radiant. That's why we said this session is to have a beautiful skin. Yes, Yes... so if you have any other comments, you can leave us comments. you can always let us know and we can always answer you to our best knowledge. skin also so is not just you, is also us, we also benefit from the session of sharing. to improve your skin appearance, as well as to improve your life styles for healthier you. Some of the tips on DIY facial. These are the things that we look forward to in our next few live show with you. you would like to know more also. tips or how to eat healthy, what food to eat healthy, how to cook. How to cook healthy food. Maybe we will cooking session next time. Yap, feel free to leave your comments. That's the end for our live.